Astronomers from around the world have combined radio telescopes on five continents, including Jodrell Bank, to prove the existence of a narrow stream of material, known as a jet, emerging from the aftermath of a violent merger of neutron stars. Astronomers using a global network of radio telescopes, including the 76-m Lovell telescope at Jodrell Bank Observatory, have produced one of the sharpest astronomical images ever. 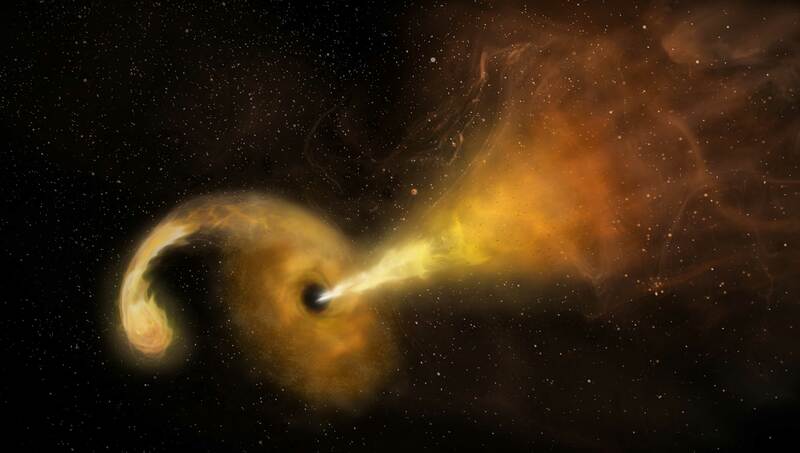 For the first time, astronomers have directly imaged the formation and expansion of a fast-moving jet of material ejected when the powerful gravity of a supermassive black hole ripped apart a star that wandered too close to the massive monster. The radio telescopes of the UK's National Radio Astronomy Facility, e-MERLIN, have been targeted on the aftermath of a collision between two neutron stars 124 million light years away. e-MERLIN as part of a multi-wavelength study of a pair of colliding galaxies has reveals the cause of a supermassive black hole's case of 'indigestion'. 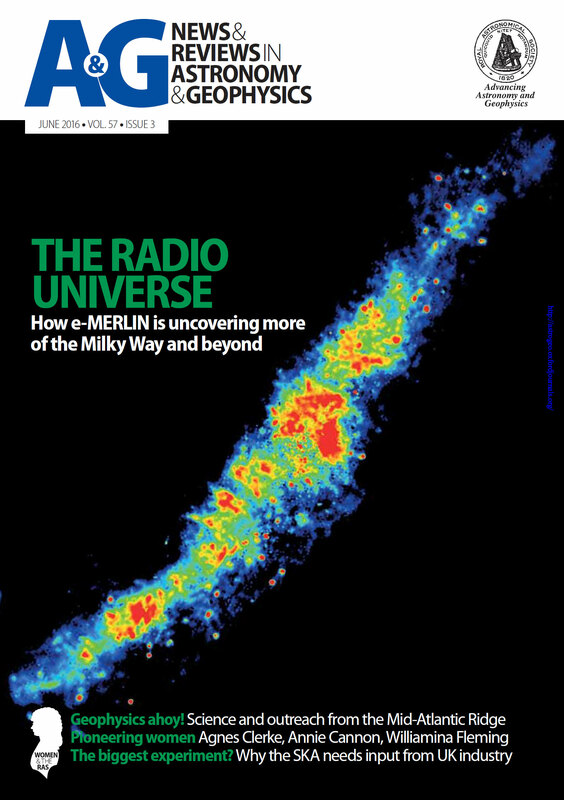 The June 2016 issue of the Royal Astronomical Society Fellow's magazine, Astronomy & Geophysics, had a cover feature on e-MERLIN. In August 2017, two neutron stars were observed colliding, producing gravitational waves that were detected by the American LIGO and European VIRGO detectors. This event is the first and only one of its type that has been observed so far, and it happened in a galaxy 130 million light years away from Earth. Neutron stars are ultra-dense stars, roughly the same mass as the Sun, but similar in size to a city like Manchester. Astronomers observed the event and the subsequent evolution across the entire electromagnetic spectrum, from gamma-rays and X-rays to visible light and radio waves. Two hundred days after the merger, observations combining radio telescopes in Europe, Africa, Asia, Oceania, and North America proved the existence of a jet emerging from this violent collision. These findings have been published in the scientific journal Science by an international team of astronomers, led by Giancarlo Ghirlanda from the National Institute for Astrophysics (INAF, Italy). This neutron star merger represents the first case where it was possible to associate a detection of gravitational waves to an object emitting light. 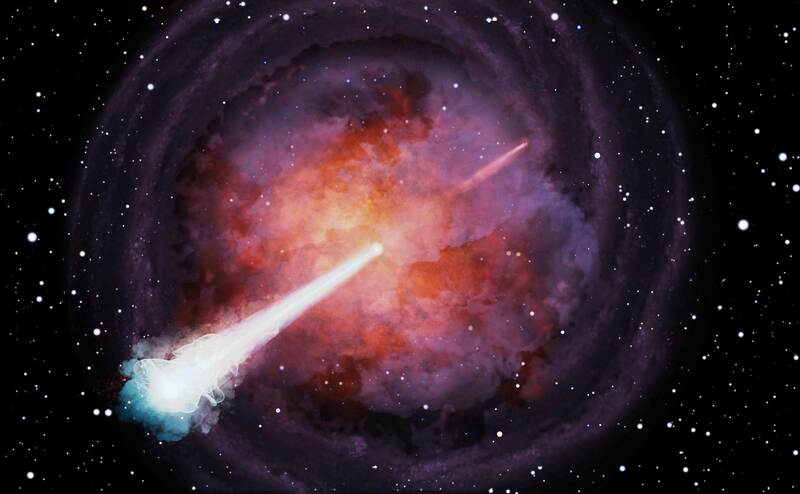 The event has confirmed scientific theories that have been under discussion for decades and the association of neutron star mergers with one of the most powerful explosions in the Universe: gamma-ray bursts. Dr Robert Beswick, co-author from the Jodrell Bank Centre for Astrophysics, said: “This is a really exciting discovery. The team has determined that this event produced a powerful jet able to pierce through the material ejected from the neutron stars as they merged. “These types of observations will allow us to unveil the processes that take place during and after some of the most powerful events in the Universe.” After the merger, a huge amount of material and energy was ejected into space, forming a shell around the object. Astronomers have been tracing its evolution at different wavelengths. However, there were still some remaining questions concerning this event that could not be clarified by any previous observations. "We expected part of the material to be ejected through a collimated jet, but it was unclear whether this material could successfully pierce through the surrounding shell" explains Ghirlanda. Tiziana Venturi (INAF) expanded “There were two competing scenarios: In one case, the jet cannot break through the shell, instead generating an expanding bubble around the object. In the other, the jet is successful in penetrating the shell and then propagates further into space” . 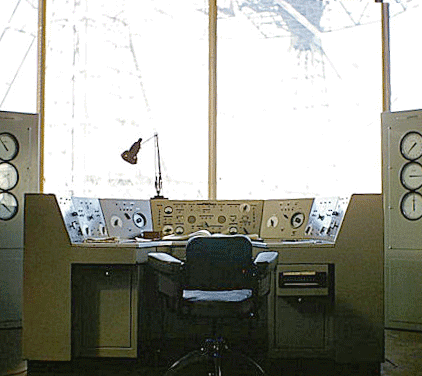 Only the acquisition of very sensitive radio images with very high resolution would discard one scenario or the other. This required the use of Very Long Baseline Interferometry (VLBI). The international team conducted global observations in the direction of the merger last year using 33 radio telescopes from around the world. 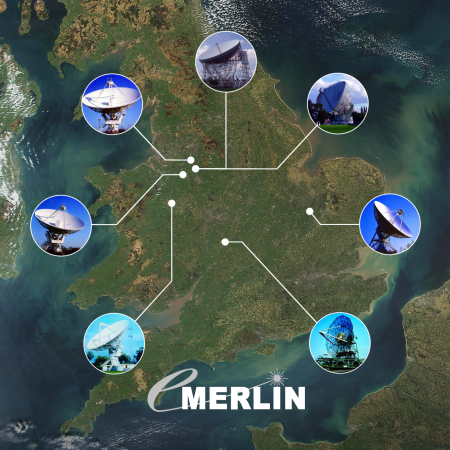 Observing in tandem with this worldwide array, the UK’s e-MERLIN array, which itself comprises 6 large radio telescopes spread across the UK and operated from Jodrell Bank Observatory, joined in this campaign allowing the team to verify and confirm the interpretation of these results. Dr Javier Moldon, co-author from the Jodrell Bank Centre for Astrophysics, added: “It is only with the extremely high resolution imaging power of the e-MERLIN, the EVN and the VLBA arrays combined that we were able to image and hence confirm the presence of a jet”. In the coming years, many more of these neutron star binary mergers will be discovered. “The obtained results also suggest that more than 10% of all these mergers should exhibit a successful jet” explains Benito Marcote (JIVE). Astronomers using a global network of radio telescopes, including the 76-m Lovell telescope at Jodrell Bank Observatory, have produced one of the sharpest astronomical images ever. The resulting image demonstrates that dark matter is distributed unevenly across a distant galaxy. The image below was created by combining data from a global radio telescope network, comprised of the European VLBI Network, and the Very Long Baseline Array and Green Bank Telescope in the United States, in an effort to address some of the fundamental questions about dark matter. The international team of astronomers aim to determine how much dark matter is present in galaxies and how it is distributed. According to current theories, a galaxy, such as our Milky Way, should have thousands of dwarf galaxies orbiting around it, yet to date only approximately 100 have been found. "It has been suggested that these dwarf galaxies could be dark matter dominated and, therefore, highly difficult to observe. However, throughout the distant Universe, we can discover the presence of these small mass structures only by using the gravitational lensing effect," explains Cristiana Spingola, lead author on the paper, from The Netherlands Institute for Radio Astronomy (ASTRON) and the Kapteyn Astronomical Institute. 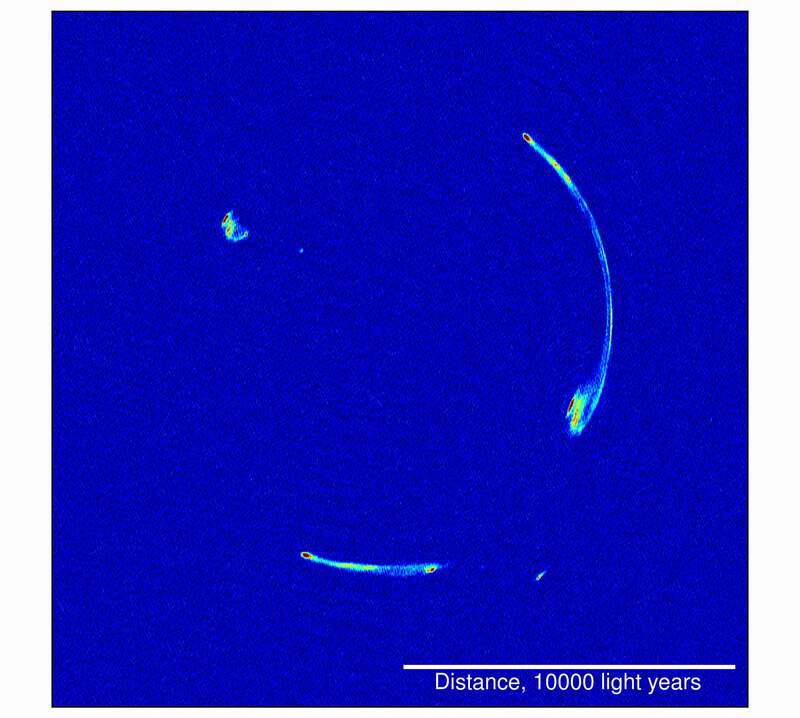 Gravitational lensing allows astronomers to observe incredibly distant radio sources that cannot be directly detected. By observing how the radio emission from the distant source is bent by the gravitational field of a massive object - the lens - located between the source and the Earth, it is possible to determine information about both the distant source and the lens. In this study the researchers used the radio source MG J0751+2716, at such great a distance that it has taken the light 11.7 billion years to reach the Earth. This object is comprised of a black hole with a powerful ejection of material, known as a jet. The lens consists of a group of galaxies located at a look-back time of 3.9 billion years from Earth. In the study, the astronomers were able to determine the distance, brightness and projected size of the radio source, together with the composition of dark matter across the lens, which appeared clumpy and uneven. "For the first time we were able to observe large gravitationally lensed arcs on extremely small angular scales. The background source - the black hole with radio jets - is distorted into these arcs on the image because of the gravitational effect of the foreground galaxies (the lens). It is a rare possibility to get such an extended arc." Spingola added, "the unprecedented detail of these extended gravitational arcs allowed us to infer with high precision the distribution of the matter of the galaxy acting as a lens." It is only possible to obtain such high-resolution data by coordinating multiple telescopes to observe the same radio source simultaneously. In this case, 24 radio antennas from across the globe were connected using a technique called Very Long Baseline Interferometry (VLBI). Data from all the telescopes was collated in a process known as correlation, at a super computer housed at the Joint Institute for VLBI ERIC in Dwingeloo, the Netherlands. To better understand the properties for dark matter, the team are now applying sophisticated numerical algorithms to quantify the nature of the clumpy dark matter. But, they are also on the hunt for more extended gravitational arcs just like this. "There are only a limited number of gravitational lenses suitable for this study, and while we have started this search using the European VLBI Network and the Very Long Baseline Array we expect that there will be more giant radio arcs in the future," explained John McKean, project lead from the Netherlands Institute for Radio Astronomy (ASTRON) and the Kapteyn Astronomical Institute. This study was led by John McKean from the Kapteyn Astronomical Institute, University of Groningen and the Netherlands Institute for Radio Astronomy (ASTRON), Dwingeloo on behalf of the international research team SHARP (Strong Lensing at High Angular Resolution Project) led by Chris Fassnacht (University of California, Davis), and also including Matt Auger (University of Cambridge), Leon Koopmans (University of Groningen), David Lagattuta (University of Lyon) and Simona Vegetti (Max Planck Institute for Astrophysics). Their findings can be found in Issue 4, Volume 478 of the Monthly Notices of the Royal Astronomical Society, published by Oxford University Press. The event took place in a pair of colliding galaxies called Arp 299, nearly 150 million light-years from Earth. At the core of one of the galaxies, a black hole 20 million times more massive than the Sun shredded a star more than twice the Sun's mass, setting off a chain of events that revealed important details of the violent encounter. The scientists tracked the event with multiple radio and infrared telescopes, including the Lovell Telescope at Jodrell Bank Observatory, working as part of the European Very Long Baseline Network (EVN). Only a small number of such stellar deaths, called tidal disruption events, or TDEs, have ever been detected. Theorists suggested that material pulled from the doomed star forms a rotating disk around the black hole, emitting intense X-rays and visible light. It also launches jets of material outward from the poles of the disk at nearly the speed of light. "Never before have we been able to directly observe the formation and evolution of a jet from one of these events," said Miguel Perez-Torres, of the Astrophysical Institute of Andalucia in Granada, Spain. "Tidal disruption events can provide us with a unique opportunity to advance our understanding of the formation and evolution of jets in the vicinities of these powerful objects," he added. Dr Rob Beswick, from the Jodrell Bank Centre for Astrophysics at The University of Manchester's School of Physics and Astronomy, and co-investigator of this project, said: "This is a fantastic discovery and an extremely important result in astronomy. It is a testament to the persistence of the science team and demonstrates the power of globally coordinated VLBI observations, including multiple telescopes from Jodrell Bank Observatory and the e-MERLIN array in the UK." Dr. Beswick, Head of Science Operations and Support of UK's e-MERLIN/VLBI National Facility, added: "The discovery came as a surprise. The initial infrared burst was discovered as part of a project that sought to detect supernova explosions in such colliding pairs of galaxies. Arp 299 has seen numerous stellar explosions, and has been dubbed a 'supernova factory.' This new object originally was considered to be a supernova explosion." Only in 2011, six years after discovery, the radio-emitting portion began to show an elongation. 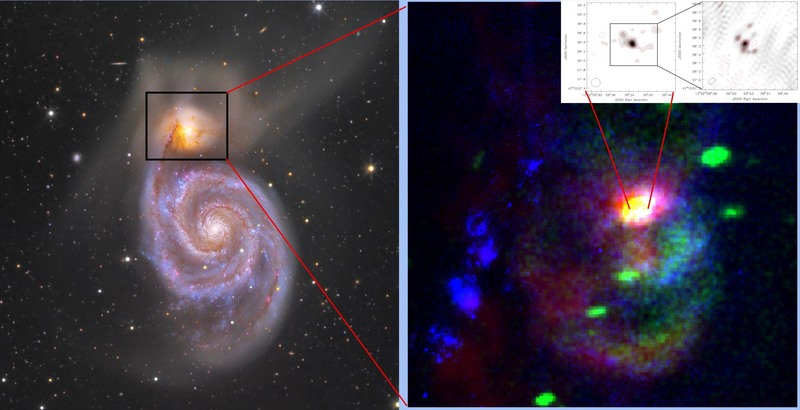 Subsequent monitoring showed the expansion growing, confirming that what the scientists are seeing is a jet, not a supernova. These observations used multiple radio-telescope antennas, separated by thousands of miles, to gain the resolving power, or ability to see fine detail, required to detect the expansion of an object so distant. "A global network of collaborating radio antennas is the only way to see this jet structure and study the evolution of such distant objects in detail." says Eskil Varenius, formerly at Onsala Space Observatory in Sweden, now at Jodrell Bank Centre for Astrophysics in the UK. "It is incredible what these telescope networks can do. This is a clear case where international collaboration achieve a combined whole much greater than the sum of its parts." 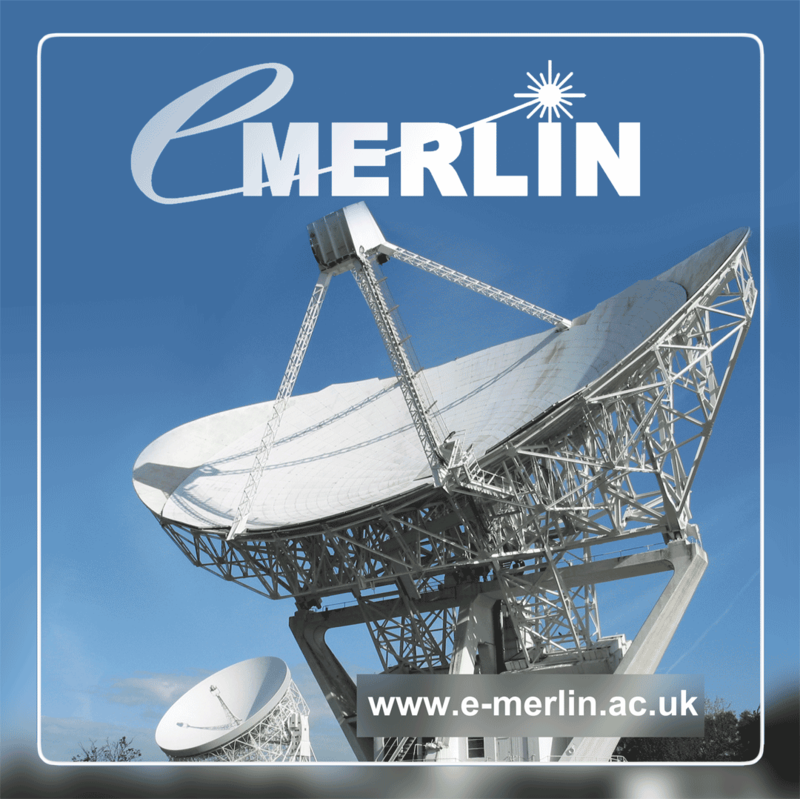 The radio telescopes of the UK's National Radio Astronomy Facility, e-MERLIN, have been directed low in the southern sky in recent weeks. Their target the aftermath of a collision between two neutron stars 124 million light years away. The collision between these two super-dense remnants of exploded stars produced ripples in space-time which were detected by the LIGO gravitational wave observatory. Remarkably, other telescopes working across the spectrum from radio to gamma-rays were also able to detect the collision and its aftermath - the first time any cosmic event has been seen in both gravitational waves and by its electromagnetic radiation. The power of e-MERLIN, working alone and in combination with the wider European VLBI Network of telescopes (EVN), is the ability to zoom in on the fine detail of these gravitational wave events and help pinpoint their precise locations. Observations with e-MERLIN began on August 23, just 6 days after the gravitational wave detection. 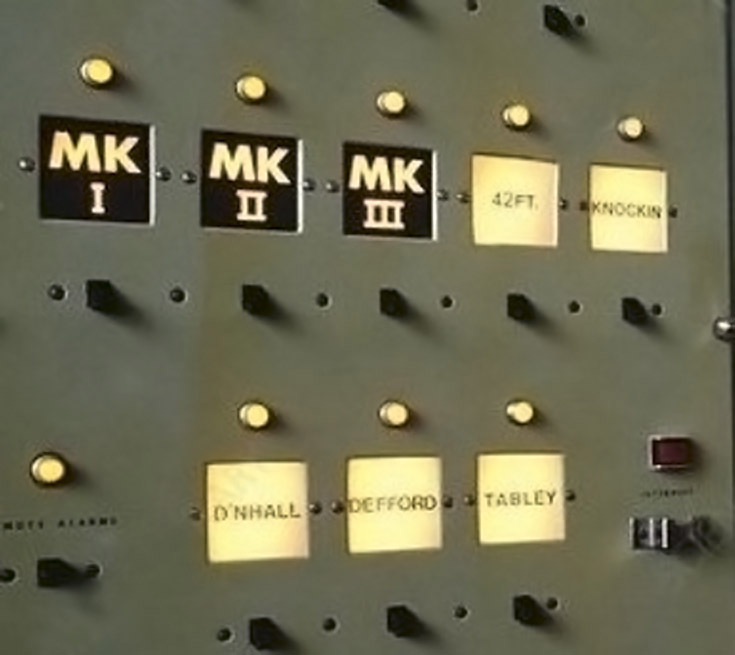 As Rob Beswick, Head of e-MERLIN Science Support at the University of Manchester's Jodrell Bank Centre for Astrophysics, explains, the observations of this particular event are challenging: "We are reporting today on 22 epochs of observation extending over the period from 6 to 36 days after the collision. This particular source is very low in the southern sky as seen from the UK, which means it only rises above the horizon for a few hours a day, limiting the time we can spend on it and hence making it harder to detect its very faint radio emissions. "Even so, we are tantalisingly close to obtaining a detection. At the moment, our 1-sigma noise level is about the same as the faint transient signal detected by the Very Large Array 16 days after the outburst. Nevertheless, this places very useful stringent limits on the radio emissions over this period. "We are continuing to obtain e-MERLIN and EVN observations. In the near future, we will also be able to include the giant Lovell Telescope in our array, greatly increasing its power. As the source evolves and potentially brightens in the coming weeks, this will make a detection far more likely." Simon Garrington, Director of e-MERLIN and Associate Director of Jodrell Bank Centre for Astrophysics, added, "This discovery is hugely exciting and will be the first of many electromagnetic counterparts to gravitational wave sources in the coming years. "e-MERLIN is a powerful instrument capable of providing rapid and extremely sensitive radio observations of these events with high magnification imaging that rivals that of the Hubble Space Telescope. 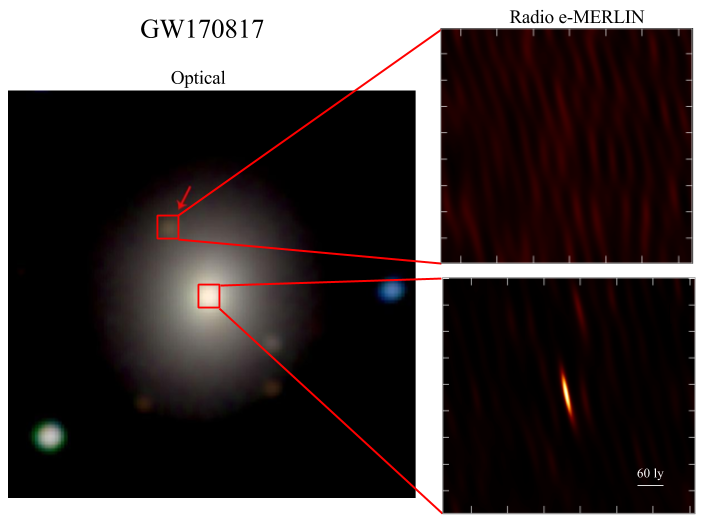 The detection of radio emissions from these gravitational wave sources is right at the limit of our current capabilities; however planned enhancements to e-MERLIN over the next few years will make future follow-ups routine. "e-MERLIN and EVN will be crucial tools to zoom in at radio wavelengths, enabling precise (millisecond) localisation of GW events in space. Detailed localisation is likely to prove fundamental to our understanding of the energetic processes at the heart of these titanic events." Once every couple of hundred million years, the small galaxy NGC 5195 falls into the outer arms of its larger companion, NGC 5194, also known as the Whirlpool galaxy. Both galaxies are locked in a gravitational dance that will result - billions of years in the future - in the formation of a single galaxy. As NGC 5195 plunges into the Whirlpool, matter streams onto the supermassive black hole at NGC 5195's centre and forms an accretion disc. The disc grows to a point where the supermassive black hole can no longer accrete or 'digest' efficiently and matter is blasted out into the surrounding interstellar medium. Last year, NASA's Chandra X-Ray observatory spotted arcs of X-ray emission that appeared to result from this 'force-feeding'. Sign up for our e-newsletter containing useful information on proposal cycles, observer's tools and recent hardware upgrades at the UK National Facility.